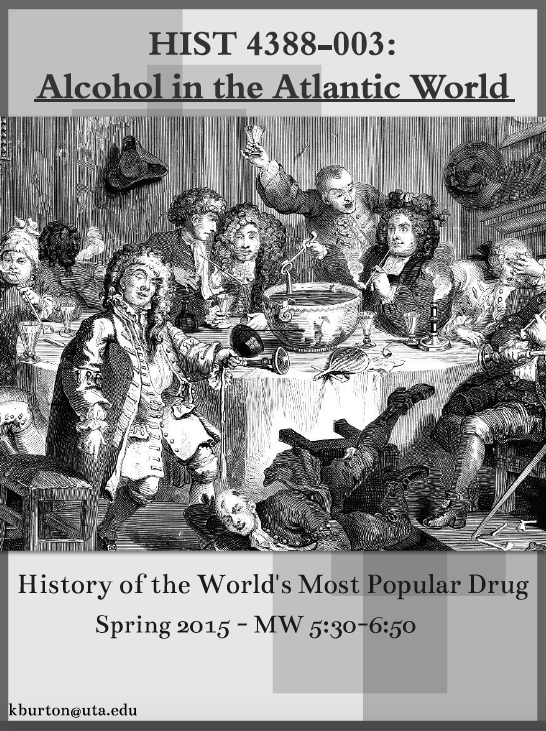 HIST 4388 – Alcohol in the Atlantic World – Kristen D. Burton, Ph.D. This course will introduce the history of humans’ conflicted relationship with alcohol. Beginning with a brief overview of the origins of alcohol, the class will focus on the early modern and modern eras of alcohol production and consumption in the Atlantic World. Throughout the semester, the students will learn about legal restrictions, shifting perceptions of drunkenness, and uses of alcohol as a commodity. The students will analyze questions of economic significance and moral responsibility concerning one of the world’s most popular intoxicants. Students will engage in weekly readings and class discussions, give an oral presentation over a primary source of their choice, and produce written position papers throughout the semester to demonstrate their critical understanding of alcohol’s role in history. Iain Gately, Drink: A Cultural History of Alcohol (New York: Gotham Books, 2008). James Nicholls, The Politics of Alcohol: A history of the drink question in England (New York: Manchester University Press, 2009). J. Rorabaugh, The Alcoholic Republic: An American Tradition (New York: Oxford University Press, 1979). Sharon V. Salinger, Taverns and Drinking in Early America (Baltimore: The Johns Hopkins University Press, 2004). Frederick H. Smith, Caribbean Rum: A Social and Economic History (Gainesville, FL: University Press of Florida, 2008). Follow Twitter discussions at the class hashtag: #H4388.